BECAUSE it regulates his conduct, it is difficult to conceive anything of greater importance to man than his religion. Even though it be unconscious and ill-defined, every person has a philosophy of life which determines his thoughts and actions in the face of innumerable circumstances by which, from day to day, he is confronted. He is aware of his own existence, and he is aware of the existence of other entities and forces than himself. It is impossible to ignore these other energies and persons and things, for continued existence demands they be recognized and due allowance made for their value as life-supporting or life-destroying factors. Thus each person is constantly called upon to make an adjustment to meet the requirements of contact with this or that entity, person or force. The nature of the adjustment so made depends upon his philosophy of life, conscious or unconscious, and which, although he may be inclined to reject the word may, in its broadest sense, be termed his religion. Because his conduct is regulated by his philosophy of life, perfect conduct depends upon a perfect religion, and a perfect civilization, depending as it does upon man’s conduct, is impossible without a perfect philosophy. Such a perfect religion must define man’s proper relation to all other entities in the universe. But we can only formulate a system of relations between man and other men and entities from a knowledge of the man and his functions and a knowledge of other men and entities and their functions. Perfect relationship can only be determined from a complete knowledge of the man and a complete knowledge of other men and other entities. Such complete knowledge of man and such complete knowledge of all other entities and forces in the universe is not at hand. Consequently there can be no such thing as a complete and perfect religion. Perfection is too much to expect, for this is a progressive existence, and progress demands new adjustments from time to time. We can conceive of no limit to the information it may be possible for man to obtain. New information must be assimilated by any adequate religion, and is thus being assimilated by The Religion of the Stars as fast as it is amply verified. To be adequate, religion must be based upon as complete a knowledge of man and other entities as possible. It must not remain stationary. It must progress even as knowledge progresses. Such knowledge is not to be obtained by theorizing, nor by building fantasies—much as the human mind is prone to follow this line of minimum resistance—but by painstaking observation of man and other entities, by careful research into the life histories of men and all other living things, by investigating the psychology of the human mind and that of other creatures, and by extensive research on other than the physical plane. Only upon the most inclusive knowledge of both the inner plane and the outer plane can we hope, at last, to build a theory accurately and truthfully portraying, in so far as present day circumstances will permit, man’s proper relation to all. The theory of human life and conduct so derived, which we call The Religion of the Stars, must be logical inferences based upon as many inner-plane facts and outer-plane facts as it is possible to acquire. Nature, in her various ramifications is so vast that any one man may personally investigate thoroughly only a small fraction of the whole. Hence, men of science usually specialize and devote their chief endeavor to some single section, or small department, of nature. They attain great skill in research, and gain much precise knowledge concerning the minute region of the universe to which they direct lifelong attention. But because of this they are hardly better fitted to pass judgment on the whole than the man who has made no study. To pass competent judgment about the universe, there must be available for comparison facts, not merely about a single department, but fundamental facts regarding as many departments and sections of nature as possible. During the first thirteen of the years mentioned, up to 1947, Duke University Laboratory alone conducted over one-million trials of extrasensory perception; other university laboratories, following similar methods reported over two million trials, and there were something over a million trials, with responses from over 46,000 subjects made by the Zenith radio program in the winter of 1937-38. No intelligent person who follows the scientific experiments with psi phenomena over the years can fail to be convinced that the soul continues to live beyond the tomb, and that its personality there is in essential respects that which it exhibited while on earth. 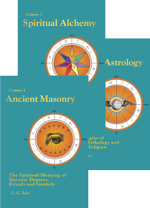 Nor can any intelligent person who learns to erect and progress a birth chart fail to be convinced that the inner-plane weather, which consists of astrological energies, has as much or more influence over human life than the physical weather. Man lives in, and is influenced by, both an outer-plane world and an inner-plane world. And there has been a vast amount of observation, carefully checked, which indicates that if we consider man to consist of his physical body, his astral body, his mind or soul, and the thoughts which he thinks, the inner-plane environment—which includes objects, the actions and thoughts of intelligent entities, and astrological energies—has as much influence over his thoughts, feelings and behavior as do all outer-plane conditions and energies, including the influence of his associates. 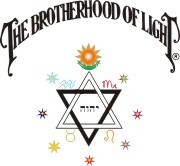 The facts thus far discovered relative to the inner plane, its energies and the way its inhabitants live are set forth in the other 20 Brotherhood of Light courses. In this course a survey of the fundamental facts having to do with the progress and development of life and religion on earth will be made, in so far as it is possible to cover so vast a field in so limited a space. Necessarily this outline must be brief, and because the scope of nature is so limitless, that which is included is as a pebble to a mountain to that which is both interesting and important that must be omitted. Yet if I can sketch even so brief, though clear a picture of the processes that, according to the latest findings of science, have brought the world from its primitive stardust to where it is inhabited by civilized man, and show the steps by which his religion has reached the present stage, I shall be quite satisfied. But in addition to explaining the processes by which life on earth has made constant progress, I believe I should also point out the factor which during 1900 years most retarded the acquisition of knowledge of the physical world, and which at the present time is the greatest hindrance to the dissemination of information about the inner world. Orthodoxy for centuries kept the Western World behind an iron curtain by means of the Inquisition. It no longer resorts to ruthless violence, but it persists in building an iron curtain that effectively prevents most from learning the facts. In their emotionally impressionable childhood people are taught they should make no investigation of religion. They are impressed that instead they should place reliance on blind belief. And to keep them behind this iron curtain of ignorance they are threatened with eternal suffering after earthly life is done. In 1163, acting in conjunction with the Council of Tours, Pope Alexander III forbade ecclesiastics to study “physics or the laws of the world.” Roger Bacon, over a hundred years later, failed to obey this order. He explained the rainbow and other natural phenomena by scientific methods. In 1278 the Franciscan order condemned his teachings, and later the Pope threw him in prison for 14 years. He was not released until he was 80 years of age. In 1243 the Dominicans forbade every member of their order to study medicine or natural philosophy, and in 1287 forbade them to study chemistry. In 1380, Charles V of France, at the insistence of religious authorities, forbade any person to possess furnaces and apparatus necessary for chemical processes, and in 1404 Henry IV of England made a similar law, as did Venice in 1418. Having set the date of creation, orthodoxy did all in its power to discredit the records of the rocks and the evidence of early man. Fossils to it were the remains of the flood of Noah, and the artifacts of primitive man were those of people living later than 4,000 B.C. There was a great outcry when in 1844 Robert Chambers published his Vestiges of Creation, still greater anger when on July 1, 1858, the papers of Charles Darwin and Alfred Russel Wallace were read before the Linnean Society of London, and a tirade of abuse in 1859 when Darwin’s Origin of Species was first published. It is not surprising that man in the past had erroneous ideas about himself, about the earth, and about life after physical dissolution. Nor at the present day do we possess all important information on these subjects. It is not to criticize the ignorance of the past, or that of the present, that these matters are being mentioned. It is to point out how the iron curtain of fear erected by orthodoxy has impeded investigation and has made people afraid to recognize facts which are essential to their present and future well being. And to emphasize that this iron curtain of fear erected by orthodoxy must be lifted if man is to live to best advantage. Raising the iron curtain of orthodoxy has been difficult even where the physical world is concerned. But to raise it where inner-plane facts are concerned, even though this is equally important, is a far harder job. Relative to the earth itself, Archbishop Ussher of Ireland in 1654 declared from his study of the Scriptures that Creation had taken place in the year 4004 B.C. This was then inserted in the authorized version of the Bible. It became, along with the notions of other church men of previous times, part of the orthodox dogma. As such it discouraged all research as to the actual age of the earth, and brought denunciation on the head of any person who made such investigation. Yet in 1778 Buffon had the courage to estimate the age of geologic time as 75,000 years. In 1860 Phillips shocked his contemporaries by placing the age of the earth at 60 million years. But by 1900, as the result of studies of time taken by erosion to level mountain chains, build sedimentary rocks, and to cut canyons thousands of feet deep in these rocks, geologists usually accepted 100 million years as the probable age of the earth. They found that in recent years Niagara Falls had retreated five feet a year, wind erosion at certain places in the Gobi Desert was at the rate of five feet in 156 years, the bluffs of till along the shore of Cape Cod were receding at the rate of from one to three feet a year, peat was accumulating in marches at Lynn, Massachusetts, at the rate of three to four inches in fifty years, the rate of down cutting of the Nile at the Cataracts has been at the rate of 25 feet in 4,500 years, and certain glaciers deepen their cirques 0.57 millimeters a year. Where periods are not too long, estimates derived from such rates of change are fairly accurate. For shorter periods where each annual layer of sediment remains distinct enough to be counted, as are rings of a cut tree, there is a still more precise measure. For instance, such annual varves of clay representing 20,000 years or more have been counted in many lake beds. There was no precise measure of the longer periods of time which had elapsed since the rocks of earth were formed until after 1902. That year radium was discovered, initiating the study of simple elements which are subject to spontaneous disintegration. About twenty such atoms are known in nature which expel parts of their nuclei. The process is quite regular, very slow, and the speed of such disintegration cannot be changed by heat, pressure, or any other known external influence. In one year heavy uranium spontaneously loses one atom out of 6,570 million; light uranium (actino-uranium) loses one atom out of 1,030 million, and thorium loses one atom out of 20,000 million. The atoms thus lost go through various changes some of which require only a fraction of a second and some of which not less than a million years. These changes follow a regular known sequence, and finally become stable nuclei each of which is an isotope of lead. Lead of non radioactive origin always contains a slight proportion of an isotope with an atomic weight of 204. This never appears in the course of radioactive disintegration. Instead, the isotopes of lead resulting from the disintegration of heavy uranium, light uranium and thorium have atomic weights of 206, 207, and 208. Therefore natural lead in rocks can readily be distinguished from lead due to radioactive disintegration. If a rock containing ordinary uranium was formed a billion years ago, about 14 percent of the original uranium atoms will have disintegrated and been replaced by an equal number of atoms of lead. The weight of the lead will be 12 percent of the original uranium, and the weight of the helium liberated in the disintegration will be two percent. The ratio between the amount of lead and the amount of uranium found in the rock provides a faithful and very sensitive clock for timing the age of the rock. On the basis of such calculations, uranite deposits at Great Bear Lake are 1,375 million years old, and dykes in the Black Hills at Keystone, So. Dakota, are 1,420 million years old. The oldest dated rocks thus far found are a formation in Carelia, Russia. They are 1,800 million years old. These dated rocks, however, are not the oldest, for they consist of intrusive material thrust through older surrounding rocks which contain no radioactive minerals. It is assumed, therefore, that the oldest rocks are about two billion (2,000,000,000) years old. As to how old the earth was before it was cool enough for its crust to solidify as rock, science is today in as much of a predicament as it was at the turn of the century in estimating the age of rocks. 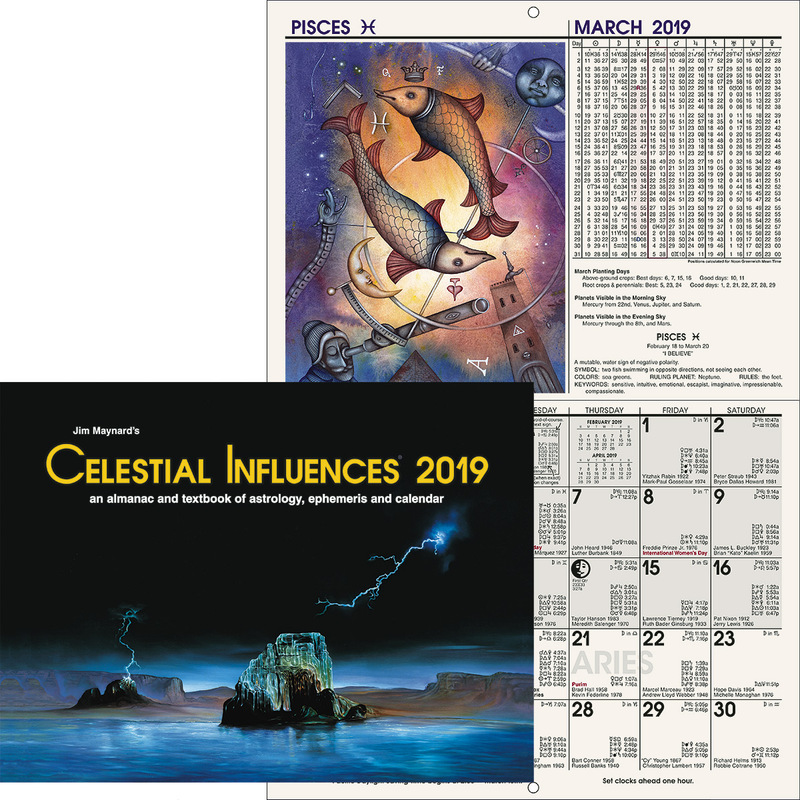 To replace the nineteenth century Laplacian nebular hypothesis, there has appeared in the present century the tidal friction theory of Jeans and Jefferies, the planetesimal theory of Chamberlin and Moulton, and a still newer theory of Jefferies. The tidal friction theory and the planetesimal theory assume the close approach of two stars, and the newer theory of Jefferies a side swiping collision between them. In each case one of the stars, or what is left of it after the side swiping collision, passes off in a hyperbolic orbit. The close approach or the collision is supposed to have caused the ejection of material from the star which we call the sun. The planetesimal theory postulates that the ejected material condensed and solidified quickly into small objects known as planetesimals, and that the planets were formed by the gathering together of the small planetesimals about nuclei. The tidal theory and the later one of Jefferies assume the planets were formed by the condensation of large masses of hot diffused material. On the basis of these theories it has been assumed the earth was in existence about a billion years before it solidified. Thus a geological time clock in the American Museum of Natural History made in 1931 gives the gaseous stage of the earth as 400 million years, at which time, 2,600 million years ago, meteors began to fall. Then followed 600 million years of Azoic time before the earth’s crust formed about two billion years ago. However, not only have discrepancies been found in each of these three theories, but the most eminent astronomers in this year of 1949 believe our universe cannot be much more than two billion years old. Even as in the opinion of science since the turn of the century the age of the earth has increased, so in its opinion has the age of the universe decreased. Since the commencement of this century Milne demonstrated that the sun cannot have existed more than 5,000 billion years, and Eddington held that it seemed unlikely the age of the stars, systems and galaxies could go back more than 10,000 billion years. The spiral nebulae, which are galaxies beyond our own galaxy of the Milky Way, are each made up of hundreds of millions of stars. And they all appear to be moving away from us and from each other at speeds that increase in proportion to their distance. If this expansion has been continuous at the indicated rate, not much over two billion years ago all of the observable universe must have been concentrated near one point. The theory is that the universe in its present form resulted from atomic explosion within this once compact mass. The movements of stellar bodies can be observed only through the aid of light. The red shift in the spectrum indicates the movement of these galaxies away from us. One of the problems astronomers hope eventually to solve by means of the 200-inch telescope on Palomar Mountain is whether the red shift is due to some hitherto undiscovered law of nature, or actually indicates the universe is expanding. In 1940 work was begun on the 4,000-ton atom smashing apparatus at the University of California. Its construction, interrupted by World War II, was resumed in 1945. Then the original design had to be modified to adapt it to the newly-recognized principle of frequency modulation. It had to be modified to make correction for the effect indicated by the Special Theory of Relativity which makes particles increase rapidly in mass as their velocity approaches that of light. And it is possible—as relativity affects not only gravitation, as is also demonstrated by psychokinesis, but distance, as demonstrated by its apparent lack of interference with extrasensory perception and telepathy, and time, as demonstrated by the ability of extrasensory perception to perceive events both in the past and the future—that light rays traveling through space for hundreds of millions of years are subject to laws not yet recognized. Not only is matter converted into atomic energy for many present day uses, but it has been proved that when an electron meets a positron both are annihilated with the release of gamma radiation. And it has been proved that the action of a gamma ray on the electromagnetic field can call an electron and a positron into existence. That is, matter can be created from energy. Although other scientists do not all agree with him, Professor R. A. Millikan, one of the two outstanding authorities on the cosmic ray, holds that in their primary form they are a result of the synthesis of certain types of atom in outer space and that they represent the “mass defect” energy of these atoms. At least we now know, due to progress in photography, that interstellar space, two decades ago believed to be empty, contains a tremendous amount of microscopic matter. Jan Oort, in 1948 president of the International Astronomical Union, calculates that the interstellar gas and dust contains as much matter as all the stars. In the Milky Way, only a minute segment of the observed universe, this comes to 300 million million times the mass of the earth. Hydrogen and helium are prevalent, and some think these two gases are the building blocks from which by nuclear synthesis many of the other elements were made. The most plausible theory of today (1949) is that our solar system once consisted of a vast dust cloud which began to condense under gravity. As the Milky Way itself rotates, dust clouds within this area would also rotate. According to the law of conservation of angular momentum, as it shrunk in size it would rotate more rapidly. With resistance diminishing and gravity increasing the cloud would collapse faster and faster, its final collapse to a size equal to that of the solar system requiring only a few hundred years. Due to increased pressure the temperature would rise tremendously, and in its final white-hot phase the sun would become hot enough to start the nuclear reactions among carbon, hydrogen and helium which some believe is the source of its continued heat. It is held that some of the revolving cloud condensed into minor clouds and in the final collapse of the sun these were left stranded to become planets. A number of known laws, including that of the pressure of light from the sun, are called in to account for their behavior and that of their satellites. According to this theory, neither the earth nor the universe need to have been in existence over about two billion years, and thus its materials could have resulted from an atomic explosion of a central mass not much longer than that ago. The evolution of life, as will be made plain in subsequent chapters, is from the simple toward the more complex. But inorganic evolution, in obeyance to the Carnot-Clausius law, moves successively from the more complex to the simple. According to this law every successive inorganic state entails a definitive decrease in its available energy. Unless it is able to borrow energy from some other system—such as the astral plane—the material universe is running down and in time will reach a state of inert symmetry. From whence came these molecules, atoms, protons, neutrons, positrons, electrons, mesons, photons and possibly neutrinos of the inorganic world which are now running down? And from whence came life which is now evolving from the simple to the complex? Lecomte du Nouy in 1947 showed by probability calculations the inconsistency of believing the appearance of the first living cell to be due to a chance combination of inorganic molecules. Psychical researchers have found that whenever physical conditions were present that would permit the manifestation of intelligence, that intelligence always was present there to manifest itself. In other words, there is an inner plane, nonphysical in nature, and not subject to physical laws, where intelligence of incalculable grades at all time persists. It is on this plane that the unconscious mind or soul of man exists while it functions through his physical body, and it is on this plane that it will continue to function and develop after the dissolution of the physical vehicle. There is no evidence of the existence of a God who has human frailties, a God who unjustly can be persuaded to favor some special nation, Who punishes those who strictly follow religious doctrines in which they believe, but which do not conform to those of some other creed, and Who can be cajoled or bribed into granting special, and quite unjust favors to those who give Him praise and beseech Him in prayer. But that there is an all-pervading Super-Intelligence which can be contacted there is much ESP evidence to prove. But not a God of whim and cruelty, such as would condemn to eternal suffering those who had no opportunity to embrace, or whose early conditioning in belief determined by environment over which they had no control caused them to reject, some special faith. If, as has been amply demonstrated in university laboratories, the mind can manipulate physical objects, and if, as psychical researchers have demonstrated, mind on the inner plane with various grades of intelligence is at all times present, there seems good reason to conclude that the trend of evolution is in response to the psychokinetic power of images within the mind of the all-pervading inner-plane Super-Intelligence. Under the jurisdiction of the overall Super-Intelligence, lesser intelligences on the inner plane perform their psychokinetic functions. 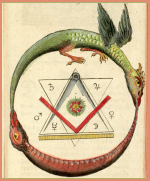 According to the old Hermetic teaching, substance, motion and intelligence are inseparable and eternal. According to this teaching the positron and the electron which can be manufactured from the energy of an electromagnetic field are merely the high-velocity astral substance of the inner plane which has been slowed down through polarity. Lecomte du Nouy in his book Human Destiny, has pointed to the fact that material science has utterly failed to account for life even in its most elementary form. To account for it, and to account for its evolution, the existence of an inner plane where mind resides and exerts a formative pressure on the lower-velocity physical substance must be recognized. After studies with the 200-inch telescope on Palomar Mountain, which start this year, have been completed, there will be much revision of present views about the universe. This glass will reach twice as far into space as the 100-inch telescope on Mt. Wilson, which is the largest used previous to this year. According to calculations made from observation with it and smaller telescopes our sidereal universe, or galactic system embraced within the Milky Way, is in the shape of a lens between 200,000 and 300,000 light years in maximum diameter and about one-tenth of this in thickness. It is estimated to contain about 100 billion stars. Within this main galactic system in the vicinity of the sun is a local system which also is somewhat lens shaped, having a maximum diameter of about 20,000 light years. The sun is about 275 light years from the center of this local system, which inclines to the plane of the main system at an angle of about 12 degrees. The local galaxy is about 65,000 light years from the center of the main galactic system. In this main galactic system there appears to be a central condensation of material in the general direction of the constellation Sagittarius. Beyond our sidereal universe are between 50 million and 100 million extra-galactic nebulae within the one-billion light-year observational scope of the 100-inch telescope. These are of three types: spirals, elliptical and irregular. About 77% are spirals, 20% elliptical and 3% irregular. It has been proved that these extra-galactic nebulae are immense groups of stars. 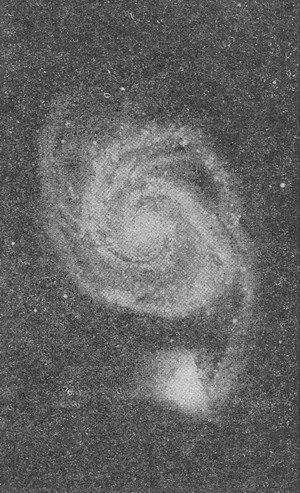 It is believed by many that viewed from the outside our sidereal universe, or Milky Way, which appears to be rotating, would appear as a huge spiral nebula, such as the spiral nebula in Andromeda appears to us. 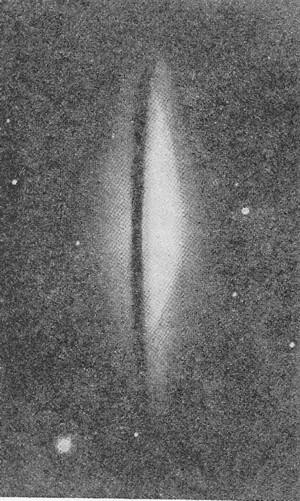 If this is the case, although other spiral nebulae are tremendously large, that of Andromeda, measuring 28,000 light years (light travels 186,284 miles per second according to measurements in 1942) in greatest length, our Milky Way is the largest of any of the galactic systems thus far measured. The Stars: The stars which are found both in the extra-galactic systems and in our own galactic system, are undergoing a process of evolution. Further advances in nuclear physics will shed light on the changes they undergo. In their early stage they are supposed to be of the type known as Red Giants, and in their last visible stage they are supposed to be of the type known as Red Dwarfs which, while so much smaller, have approximately the same mass as the red giants. The largest red giant thus far measured is the star in the constellation Scorpio known as Antares. Measured with the stellar interferometer it shows a diameter of 390 million miles. As the earth is only 92,897,000 miles mean distance from the sun, and Mars is only 141,500,000 miles mean distance from the sun, if Antares were to occupy the place of the sun, both earth and Mars would be far interior to its surface. The giants are largely composed of diffused gas at low temperature. As they contract they are supposed to get hotter and hotter until they reach the blue-white stage, when they start cooling off. Like an iron in a furnace they first become red, then orange, then yellow, then yellow white, then white and finally blue white. To conform to the two billion year expanding universe theory they reach the blue-white stage quickly, from then on cooling gradually. Thus the red giant Antares, 480 times the diameter of the sun, has a density of only 0.000,000,3, and a temperature of only 3,100 degrees. But the orange giant Capella in the constellation Auriga, with a diameter only 12 times that of the sun, has a density of 0.002 and a temperature of 5,500 degrees, and the blue-white B Centauri, with a diameter 11 times that of the sun, seems to have reached the maximum temperature before it starts to cool. Its density is 0.02 and its temperature is 21,000 degrees. After a star reaches the blue-white stage witnessed in B Centauri it begins to radiate heat faster than its continued condensation generates it. From then on radiation pressure acts against gravitational contraction and tends to hold the mass in approximate equilibrium and permits it to cool slowly. Growing smaller and smaller it passes in reverse order through the colors white, yellow white, yellow, orange and red. Finally it becomes black and invisible. There are supposed to be many more black stars in our universe than those that emit light. Sirius, in the constellation Canis Major, with a diameter 1.8 times that of the sun, has cooled to the white stage with a density of 0.4 and a temperature of 11,200 degrees. Our sun, an orange dwarf star similar in color to the orange giant Capella, has a temperature of 6,000 degrees, only 500 degrees higher than Capella, but has a density of 1.4, which is tremendously greater. Antares has a luminosity 3,500 times that of the sun, Capella 150 times that of the sun, Sirius 26 times that of the sun, and Krueger 60A has a luminosity only 0.002 that of the sun. Our sun is well past its prime, for it is an orange dwarf. But it has a long way to go before it becomes one of the countless dead suns that clutter up the universe; even a long way to go before reaching the red dwarf stage of Kreuger 60A which, with a diameter of 0.3 that of the sun has a temperature of only 3,300 degrees, but a density of nine. White Dwarfs: More than 99% of the observed stars fit into the evolutionary sequence of stars just set forth. But there are a few that do not fit into this general scheme. Because they are so small and faint they are difficult to locate. With the progress of nuclear physics more about their origin will be learned. The present theory is that they consist of atomic nuclei stripped of all external electrons and tightly packed together by gravitational compression. The first of these white dwarfs to be discovered was the companion star to Sirius. Its mass is about that of the sun, but although hotter than the sun, its luminosity is only about 1/360 as great. This means that about the same mass of material found in the sun with a mean diameter of 864,000 miles is compressed into the 30,000-mile diameter of the white dwarf. Its density, 30,000 times that of water compared with the earth’s 5.58 times that of water, is such that a cubic foot of its material weighs 935 tons. Multiple Stars: Not all the stars are single as is our sun. In many instances two stars form a system and revolve in elliptical orbits around their own common center of gravity. Sirius, the brightest star in the sky, is such a binary, its companion being the white dwarf just mentioned. Then there are triple stars, in which three stars form a system; and Theta Orionis, the star in the nebula in the sword of Orion, is composed of six stars. One multiple, as they are called, has been discovered that is really composed of a closely related system of 16 different stars. Such systems of more than one star often have one or more members of the family that are dark stars whose presence may be known only by their passing between us and some of the others. Variable Stars: Any star whose light is known to fluctuate is called a variable star. At the present time 10,000 such variables are known, and it is estimated that not less than 5% of all stars are at least somewhat variable. One type, known as the Algol type because the star Algol behaves in this manner, shows a rapid diminution of its light at regular intervals. It is believed such stars have a dark companion, or one of less luminosity—and this has been definitely proved in the case of Algol—and as the two revolve the darker of the two periodically eclipses the brighter. But there is another type of variable star whose irregular fluctuations cannot be explained in this manner. Some think they are dying suns, and that as a crust of thick vapor forms on the surface their light is shut off. Then, at irregular intervals, the molten interior bursts through and they again appear very brilliant. Others believe that they are suns traveling in a region rich in dark nebulae, and that when they enter successive clouds of dust or strike swarms of meteors the friction of the impact is the source of the added illumination. Novae: Not only are there supposed to be many more dead and dark suns—suns that have cooled below the light-emitting stage—wandering about the heavens than there are luminous ones, but many new suns apparently are observed to be born. These are called novae. Many are detected each year, and it is estimated that ten or more reach a brightness of the ninth stellar magnitude or more annually. Photographic records indicate, however, that novae are not actually new stars, but are faint stars which for some reason suddenly increase in intensity. It is not uncommon for them to gain an increase of ten magnitudes, which means an increase of light intensity of 10,000 times. At present no complete explanation is available, but with further advances in nuclear physics such an explanation may be forthcoming. The most commonly accepted present theory is that some faint star explodes and blows off its outer shell of gaseous material. This may be due to the release of atomic energy. As the shell would rapidly expand after leaving the star the displacement of spectral lines would be toward the violet, which is observed. 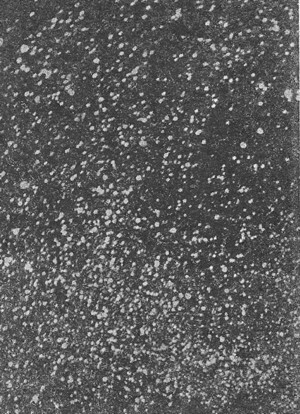 Nor are these novae, whose brightness lasts only a short time and then rapidly fades confined to our sidereal universe, for they have also been observed in some of the extra-galactic systems such as the great spiral of Andromeda. Star Clusters: Stars which move through space together in parallel paths are known as moving clusters. Many such moving clusters are known. The sun apparently is not a member of such a moving cluster, but at present is within the Ursa Major cluster, which has a diameter of 500 light years, with its members moving past us on both sides. Out on the far fringe of our galaxy are the globular star clusters. Sixty-nine of these are known, each consisting of an immense number of suns closely grouped, comparatively speaking, in a globular system of stars. Shapley, of Harvard Observatory, finds that these clusters themselves, taken as a whole, form a huge flattened cluster, probably 250,000 light years in diameter, with its center about 75,000 light years from the sun in the direction of the constellation Sagittarius. Sagittarius seems to be the bullseye center of both the globular clusters and of our sidereal universe. Magellanic Clouds: Also on the fringe of our galactic system toward the south pole of the celestial sphere appear two luminous roughly circular objects. They are called Magellanic Clouds. Occupying areas singularly devoid of bright stars, the larger covers a space of 42 square degrees and the smaller covers 10 square degrees. They appear as a promiscuous intermingling of star clouds, star clusters, and gaseous nebulae. Little is known at present concerning them. Galactic Nebulae: The nebulae within our sidereal universe, or Milky Way, are of three different types: dark nebulae, diffuse nebulae, and planetary nebulae. Several hundred dark nebulae composed of immense dust clouds and possibly other dark material have been photographed. They range in size from small spots up to the great black rift which can be seen with the naked eye that extends almost a third of the way around the Milky Way from Cygnus to Centaurus. The diffuse nebulae have no more specific shape than the dark nebulae and appear much like clouds of vapor. Their density is very low, and apparently they differ from the dark nebulae only in being luminous through usually being associated with a star which illuminates them. Planetary nebulae are so called because they have much the same appearance in a telescope as a planet. In most instances they have a star of the hot blue spectral class at their center which is associated with their radiation. These nebulae are rotating and are probably composed of ellipsoidal masses of gas. Asteroids: According to Bode’s Law there should be a planet between Mars and Jupiter in our solar system. But instead, in this orbit travel swarms of smaller bodies, perhaps 150 having a diameter greater than 50 miles and the majority having a diameter between 50 and 20 miles or less. The most widely accepted theory is that there was once a planet there, but that it broke up due to atomic explosion or to collision with another heavenly body. Comets: Comets are the largest members of our solar system, but their mass is very small. A definite connection has been established between comets and meteors. A comet was observed to disintegrate and a meteor shower took its place. Often as a comet approaches the sun the pressure of the light from the sun causes fine vapor-like material to stream out in a direction away from the sun. The earth passed through the tail of a comet twice during the last century and nothing was felt. The head of a comet, however, consisting of a swarm of iron meteors is more formidable. Not long ago such a meteor flattened a big forest in northern Siberia, and Meteor Crater, near Canyon Diablo, in northern Arizona is supposed to have been formed by a monster siderite meteor of some 500 feet in diameter, that was one of a flock that formed the nucleus of a large comet that struck the earth not more than 5,000 years ago. Meteors: In addition to the wholly metallic siderites, there are sideriolites composed of both metallic and silicate materials, and aerolites composed almost entirely of silicates. Recent calculations and observations indicate that about half the meteors are visitors from interstellar space, having their origin outside our solar system. Zodiacal Light: This light is seen in the west after evening twilight in the spring and in the east before morning twilight in the autumn. It is a pearly radiance that, cone shaped, slants up from the sunset glory, or from before sunrise, sometimes almost to the meridian, but always following the zodiac, or path of the sun. In the northern hemisphere, therefore, it leans to the south. It is due to sunlight reflected from cosmic dust. Aurora Borealis: This phenomena commonly seen in high latitudes is an electrical discharge in the ionized air exhibiting the characteristic spectrum lines of the rarer atmospheric gases. Sunspot maxima, with their eleven-year cycle, are always accompanied by maxima brightness and frequency of these Northern Lights which are always coincident with disturbances of terrestrial magnetism. At other times they are most commonly seen in March and October. The Moon: Some scientists believe the Moon was formed at the same time and in the same manner as the earth. Others hold that after its formation tidal strain caused the earth to bulge until the Moon broke off, and the back reaction of the lunar tides caused the Moon gradually to recede, and the solar and lunar tides, acting like a brake shoe against the earth’s rotation, caused the earth to slow down. The rate of slowing down, according to the records of eclipses preserved by the ancients, indicates that at present the day is lengthening about 1/1000 second per century, or a minute in six million years. This might mean the Moon broke off 10 billion years ago, or if all possible allowances be made for greater tidal retardation when the Moon was closer, the date cannot be less than one billion years ago.